One of the biggest diet crazes in recent years is going Paleolithic (often shortened to Paleo). Although the concept has been around for a while, the diet was popularized by Dr. Loren Cordain, who publishedThe Paleo Diet in 2002 and started the modern Paleo Movement. The lifestyle particularly appeals to people who are tired of being deprived of red meat, have food allergies, and or just want to eat more naturally like our ancestors. While it’s common knowledge that the Paleo diet involves eating lots of protein (ideal for those trying to pack on pounds of pure muscle at the health club), the other rules of the diet aren’t as understood. Here’s a rundown of what you can and can’t eat if you choose to go Paleo. Lean (grass-fed) meats, fish, eggs, non-starchy vegetables and fruit, nuts and seeds, healthy oils like olive and coconut. Dairy, all grains, legumes, salt, sugar, any processed foods, starches like potatoes, legumes like beans and peanuts, refined oils like canola, coffee, and alcohol. 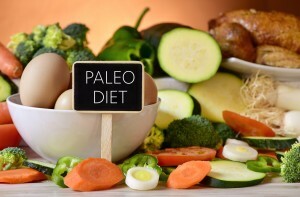 The basic premise of the Paleo diet is that our metabolisms are more suited to the way our ancestors used to prepare food – foraging and hunting…but not farming. According to Dr. Cordain’s research, early humans didn’t eat grains, dairy, or alter foods the way we have since the beginning of the agricultural age. Because of this shift to processed foods, the population is suffering from epidemic rates of obesity, diabetes, heart disease, and numerous digestive disorders. The Paleo diet is a return to ancient eating habits that promises to improve overall health while helping you lose weight — without restrictive portioning or calorie-counting. Although the ultimate goal is to live a completely Paleo lifestyle, the official plan allows up to 3 cheat meals a week, termed“open meals.” This helps ease the transition from processed foods. Many people attest to losing weight, feeling better, and gaining control of their health after going Paleo. The real question is whether this is due to the Paleo metabolic theory, or the known benefits of eliminating refined foods full of salt and sugar, and eating more ‘whole’ foods – steps recommended by any sound nutrition plan. Critics point to a lack of sufficient scientific studies and evidence that the Paleo diet cures metabolic syndrome and ailments like inflammatory bowel disease. They also assert the inability to really know what our ancestors did and didn’t eat, and that our metabolisms are more flexible than the diet proposes. Whether you buy into the basis of the diet or not, here are a few pros and cons to consider before making Paleo your go-to eating plan along with your workouts at the fitness center. Many people like the Paleo diet because it allows them to eat meat, eggs, and healthy fats. The amount of fiber in the diet leads to fullness so you don’t feel like you’re dieting (other than cravings for excluded foods). The premise of eating natural, unprocessed foods is sound, and especially suited for those with gluten or casein allergies since it cuts out dairy and grains. Since it also cuts salt, another natural benefit of the diet is lower blood pressure. Eating Paleo is a huge time and financial commitment. A diet heavy in meat and produce can get expensive quickly, and you simply must make time to prepare and cook foods at home. While it may result in initial weight loss, it’s difficult to eat out, and can become hard to follow long-term. Obviously vegans and vegetarians cannot go Paleo, and doctors recommend taking supplements of calcium and Vitamin D, folate, and other B vitamins to avoid nutritional deficiencies. Now that you know a little more about the Paleo diet, you can decide if it’s the right eating plan to boost the results of your hard work at the fitness gym. Remember – the best eating plan is one you’ll be able to follow and adopt into a permanent lifestyle of health and fitness.